30” (762mm) circular oil seasoned steel cooking surface. Two temperature zones between inner and outer surface. Variable temperatures 225ºF to 675ºF (121ºC to 357ºC). With LP Propane gas, inner burner 11,176 BTUs max, outer burner 21,131 BTUs max for a total of 40,095 BTUs. With Natural Gas, inner burner 9,709 BTUs max, outer burner 26,557 BTUs max for a total of 36,266 BTUs. Knobs separately control inner and outer burners. Natural Gas or LP Propane gas. Optional ceramic-clad cook surface upgrade. Install to steel, or combustibles with 3/8” min. clearance. Install to end base or right angle counter configurations. 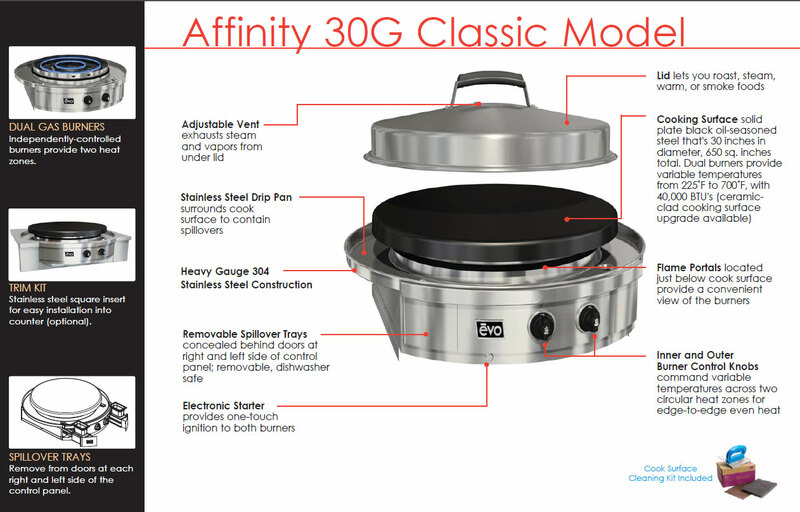 Circular cook surface and radius control panel opens design possibilities. Large stainless steel lid for steaming, roasting, baking and protecting cook surface from outdoor debris. Use Affinity Classic to: sauté, braise, flattop (plancha) grilling, pan fry, roast, poach, steam, toast. Cook surface is extremely durable and easy to clean. Stainless steel burners are protected against spill overs. Stainless steel drip pan surrounds cook surface with forward spillover slots to dual spill collection trays. Spill collection trays are conveniently located in drawers at each outward side of control panel.